We feel overwhelmed, too busy, and like there’s no time to do anything. Our relationships suffer since we can’t spend the quality time we’d like — and need — to spend with those around us. Many times the things we are taking on suffer as we’re drained of energy from all the different tasks, and it feels like we can’t make progress on anything. We burn ourselves out, lose our drive and sense of accomplishment, and often times completely lose hope that progress can be made and that things can change. Just like how we often fall into the trap of thinking it’s best to take big leaps and make massive instantaneous changes, we also let ourselves undertake too much concurrently thinking it’s a good — or necessary — way to get things done. The reasons for this tendency are many, such as a culture that promotes busyness, feeling like there are more things we have — or would like — to do than we have time for, a fear of disappointing people, saying “no” can be tough, we commit to things without fully understanding their scope, and so on. On top of that, when we are suffering from burn out, we often err on the side of doing something that makes us feel productive in that moment — e.g. needlessly sorting through emails, mail, etc — while actually not accomplishing anything of much importance. With that type of action, we feel like we are doing something and being productive, satisfying ourselves temporarily only to feel unaccomplished, unproductive, and overwhelmed shortly thereafter. How many times do we spend our days feeling like we are doing a lot, only to look back and see we didn’t really accomplish much to speak of? This approach also relates to what we usually term multitasking. In reality what we’re doing is basically rapid task switching where we jump from one task to another. It isn’t really the true parallel task execution we like to think it is. Even, for those us skilled in multitasking — which is fewer than many think — this has some significant detrimental qualities which will be explored to a greater extent down the road. We end up jumping around from task to task in an unsystematic manner, leading to inefficiencies. We waste time and will power each time we need to transition between tasks. Even if these transitions are minimal, they add up. When we get to a sticking point that should be pushed through, we tend to just jump off the task to avoid it — this is different than taking a break when it is really needed — and then put off or struggle every time we need to return to the task. Many times this leads us to retread the same ground multiple times burning through our precious time and energy. The simple, easy-to-overlook obvious answer is just to do less. Don’t take on so many tasks in life. Pick one primary one and focus on it. Get it done, see the accomplishment and move on. Doing too many things at once really does lead to slower progress and less motivation since it seems like nothing ever really gets accomplished. Narrowing our focus and then limiting what we take on goes for projects at work, projects at home, general life goals and more. How do we do less? Recognize that being super busy isn’t a badge of honor or inherently a good thing. In actuality, it’s often a harmful thing. It’s nothing to brag about, it isn’t a status symbol, and your level of busyness doesn’t reflect your worth as a person. Ask yourself: what are you doing that you don’t really need to do, and might not be as beneficial as it might appear on first glance? For example, do you really need to keep up with that TV show? Does it really help you right now to keep reading posts and comments on Facebook, Reddit, etc? In cases where there are multiple important tasks all needing done, prioritize and tackle them as close as you can to one-at-a-time, and then move forward to the next one. When you take them on in this way you better optimize your energy and resource usage, allowing yourself to get more done quicker and with better results. For example, if you have multiple household projects, such as raking the leaves, mowing the lawn, cleaning out closets, and washing the floors, take a moment to consider an efficient and systematic way to do them. If you rake some leaves, then mow some of the lawn, then go back to leaves, then lawn, etc, you’ll likely find the leaves blow around, and you’ll be raking many of the same places multiple times. Knock out the quick and easy things early. This helps you build some momentum and confidence making the bigger things easier to take on. Say “no” to things more often. This can be tough for many of us. One way to make it a bit more palatable and easier to do is to realize saying “yes” to something is in effect saying “no” to many other things. If you say “yes” to something someone asks you to do, you are in effect telling other people “no.”, you’re telling that same person “no” for something more important, and you’re telling yourself “no” for something you can do that improves your life and the life of others significantly. For big things which run for extended time periods, take on one project at a time, and build up good momentum on that project — to the point where progress becomes almost an automatic occurrence — before adding another thing. Consider what all you are doing and look to see if there are other ways to accomplish the same end goal without all the busyness. So many of us take on too many things all at once, and for the most part, we don’t really recognize that it’s a problem we need to address. To get more done, to do a better job at whatever we take on, and to be more satisfied with life overall, we need to do less, and to stop wearing busyness like a badge of honor. Doing less, and taking on a limited amount at once will allow you to get more done, faster, and with higher quality	than trying to do many things at once. When you say “yes” to something, you are saying “no” to something else — that can even mean you inadvertently say “no” to doing quality work on your current commitments you’ve already said “yes” to. Being busy isn’t a badge of honor. It isn’t symbolic of your worth as a person. It isn’t inherently a good thing. Stop doing things that aren’t necessary. Say “no” more, so you do a better job when you say “yes”. 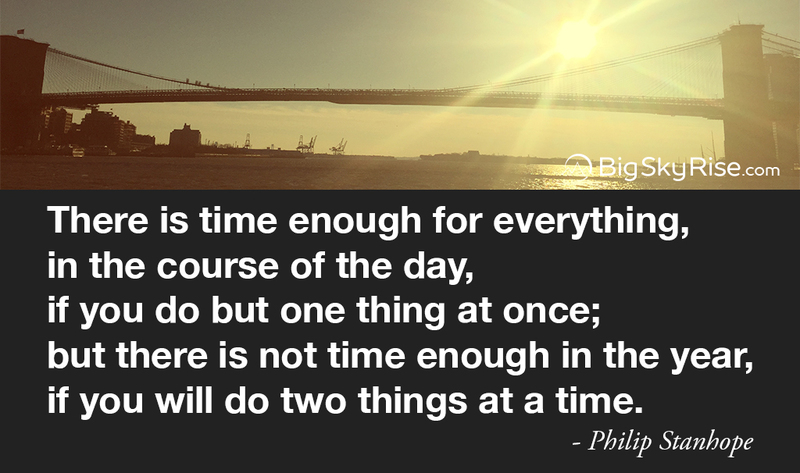 Naturally, you can do more than one single thing in the span of your day. The thing to consider here is to let go of tasks that drain you and mainly serve to interfere with the more important stuff you have to do. If you think there is someone this might help, please consider sharing this with your connections in the world.